The above wage increases may be “paused” by the Governor if certain conditions are met. These conditions are: 1) “whether economic conditions can support a scheduled minimum wage increase”, and 2) “whether the General Fund would be in a deficit in the current fiscal year, or in either of the following 2 fiscal years.” See SB-3. Labor Code § 1182.12(c)(2) ensures that the minimum wage will not be reduced. 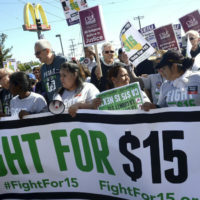 It states that if the CPI-W is negative, the minimum wage will not be increased or reduced.